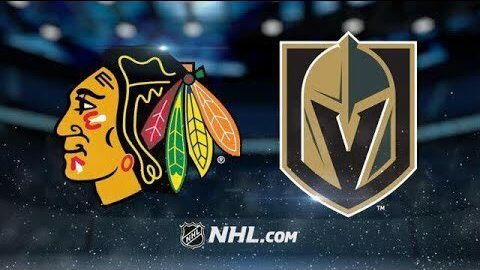 Tonight's game features the Vegas Golden Knights hosting the Chicago Blackhawks, in a rematch from last Tuesday. The Golden Knights won the last meeting by a score of 8-3. Coming into the game with a 15-13-1 record, the Golden Knights are picking up steam and climbing up the Pacific Divison ranks. On Tuesday evening, they defeated the defending Stanley Cup Champion, Washington Capitals, backed by two Nate Schmidt goals in the last 1:30 of the game. It was sweet vengeance for Schmidt, as he was left unprotected by the Capitals in the 2017 expansion draft. The game-winner and empty-net goals were his first two of the season. Vegas will have a new man on their roster for this evening's game. Reid Duke was recalled from the Chicago Wolves of the AHL, swapped with recent call up, Daniel Carr. Carr recorded a goal in his six game stint, playing on the struggling third line. It remains to be seen if Duke will slot into the lineup. Oscar Lindberg, a usual healthy scratch, picked up two assists in Max Pacioretty's place on Tuesday night. He had a pretty good game and should slot back into the lineup tonight. Pacioretty was held out of the contest with an undisclosed illness. Chicago has not been very good this season, evidenced by the 9-15-5 record. A very top-heavy team, the Blackhawks are led by the usual suspects Patrick Kane (13g, 18a), Jonathan Toews (12g, 11a), and Alex DeBrincat (11g, 11a). Goaltender Corey Crawford was shelled for six goals by the Golden Knights in the previous matchup and was pulled during the second intermission. Cam Ward made 11 saves on 13 shots in relief. Vegas actually holds the advantage when it comes to special teams in this one. The Golden Knights' power play operates at 19.4%, good for 15th in the league, while Chicago is dead last in the NHL at 12.1%. Penalty killing numbers also favor the Golden Knights who are third in the league at 84.9% compared to the 28th ranked Chicago unit (73.8%). Only the Flyers and Senators have worse penalty kills than the Blackhawks. Special teams will be an area of focus for the Golden Knights and a place they can impose their will on Chicago. Vegas had one power play goal in their last meeting. Tonight would be a good time to get backup goaltender Malcolm Subban into the Vegas net. In his last game against Calgary, he gave up seven goals, many of which he wasn't at fault for. Since that game on November 19th, Subban has been glued to the bench, including during a home back-to-back. Vegas coach Gerard Gallant is running the risk of working Marc-Andre Fleury (762 career games played) too hard and having to rely on a very cold goalie if his starter goes down (as he did last season). All of the action kicks off at 7pm tonight in the T-Mobile Arena. Be sure to tune in on AT&T Sportsnet at home or Fox Sports Radio 98.9 FM in your car. Follow me on Twitter (@VGK_Buzz), by clicking the button below, for in-game updates, discussion, and analysis.